Background: The entries below are compiled from two trips to Patriot Hills, Antarctica. The first was in 1997, en route to climbing Mount Vinson (my completion of the Seven Summits). The second was when I was en route to the South Pole by airplane. It was on the second trip that I saw the Groovy Pool, the domicile of the Ice Bubbles in the photograph. Met two gorgeous, charming 17 year-olds, Denise and Karen. Told Iman I could love her. I feel great, wonderful, higher than high, stimulated, buzzing, and all such things, out of my mind with exhilaration. It is not only the flight; but, in the quiet recesses of this private journal, I can admit, that besides soaring above Antarctica, adding to my exhilaration is the fact that I also feel in love with Denise Gutierrez from Punta Arenas. It is a feeling that came over me after I saw her today. Iman is very, very beautiful as she sits next to me. Wow – she is only 19 years old, and she is flying to Antarctica. When I consider how much older I am and what a thrill it is for me, I can only imagine what it must be like for her. She is quiet, but I sense she has a reason, and I do sense that she has a kind heart and a quiet and reserved nature. I think of the pictures I was showing her on my computer. I would hit a button, and a whole world would light up in front of us, and another, and another, world after world. I think of this as a way to describe how she appears to me, that all those nuances of expression, her almost imperceptible ponderings, each represents another world in the universe of her mind. A sole thought directed towards human rebirth. As soon as we arrived, about 10-11am, we packed and all set off. Mike and Pat burnt out under heavy loads and Jean Luc was strong. Long day, maybe seven hours. Since I’d had no sleep made it much worse. Arrived without any water. I was crabby. Stoves malfunctioning. Stayed the day resting. We were all burnt out. The weather was sort of whiting out and intermittent, so we were just as happy to stay in our tents. Ate, they retrieved stoves. Left Camp 1 in afternoon and walked about 3 1/2 hours to Camp 2. Nice walk. Sight of icefall. This place is really beautiful. Parked sleds at 2. Contemplated going today but opted for tomorrow. I am reminded of a poem I wrote for my esteemed Grandmother a year ago today. She died two months later, on March 9, 1997. She will forever remain my favorite person in the world. on plains of celestial blue. Left Camp 2 about 2pm. About 4 1/2 hour to Camp 3. Fairly heavy pack, glasses fogging through icefall, I got scared. Rest of way was beautiful. Made camp. Weather questionable. Cold when sun set at midnight. Started strong at 11am with holding clouds. Jean Luc burned out half way. He at end of rope pulling me was trying. Mad at Thierry. Crampon came loose. Thought we were on the wrong mountain! Finally summit at 7pm. Cold as hell. Walk down energized! Got lost. Awoke in freezing cold in tent with Pat & Jean Luc. Retraced steps to Camp 1. Flew to Patriot in the Twin Otter. Incredible flight. I tried to ignore Iman when we arrived but she captivated me. She said I could leave bags in her room. We talked some. At 5am, Iman and I took a walk and photos. At 7pm, after one of the greatest day hikes of my life in the frozen mountains near Patriot Hills, we came to the bottom of the blue ice field and spent about 45 minutes at ‘Groovy Pool’. It was an amazing place. 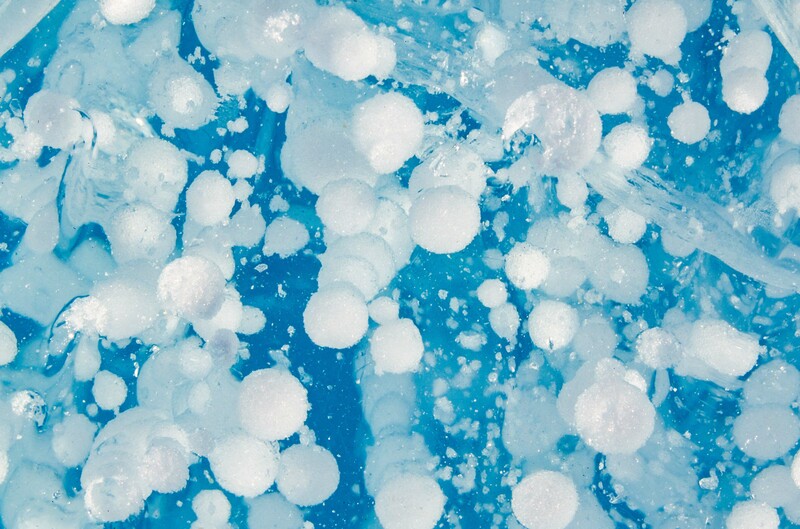 The blue ice frozen pool had white tube-like inclusions and bubbles which seemed, while rising to the surface, to have been frozen in ice, giving the appearance of being suspended in space. I shot a lot of photos using the tripod and timer at 180 mm focal length, f27 or f32 at 1/45th second. The white ‘rising’ tubes looked dream-like, as if the work of ice fairies.